DOHA, Qatar, 2018-Mar-28 — /Travel PR News/ — Qatar Airways has been named “Best Regional Middle East/Africa Airline” by the esteemed Money magazine’s 2018 “Best in Travel” awards for the second consecutive year. The award, one of the highest honors in the industry, recognises the airline for its unparalleled value, comfort and prestige, and complements a triumphant 2017, which saw the airline receive more than 50 awards across multiple categories. Earlier this month Qatar Airways was awarded the APEX Passenger Choice award™ for ‘Best Overall Airline: Middle East’; ‘Best Food and Beverage: Middle East’; ‘Best Cabin Service: Middle East’; and ‘Best Seat Comfort: Middle East’ by the Airline Passenger Experience Association (APEX) during a ceremony at APEX Asia held in Shanghai, where the airline also received a 2018 Five-Star APEX Official Airline rating. 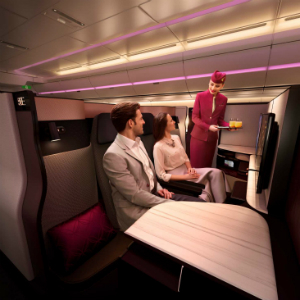 During the past several months, Qatar Airways has unveiled a new standard of travel with the launch of its revolutionary Business Class seat, Qsuite, on flights from New York’s John F. Kennedy Airport and Washington D.C.’s Dulles International Airport. Qsuite, known as First in Business, features the first-ever double bed available in Business Class, as well as movable panels that permit passengers to transform their space into a private suite, allowing them to work, dine or socialise together. When passengers wish to relax or sleep, they can transform their space back into their own private room for the ultimate in privacy and comfort. One of the world’s fastest-growing airlines, Qatar Airways has recently added a number of exciting new locales to its expansive portfolio of over 150 destinations, including Penang, Malaysia; Canberra, Australia and Pattaya, Thailand, to name just a few. The airline has a host of upcoming new destinations planned for 2018-19, including London Gatwick and Cardiff, United Kingdom; Lisbon, Portugal; Tallinn, Estonia; Valletta, Malta; Cebu and Davao, Philippines; Langkawi, Malaysia; Da Nang, Vietnam; Bodrum, Antalya and Hatay, Turkey; Mykonos and Thessaloniki, Greece and Málaga, Spain. This entry was posted in Airlines, Travel, Travel Awards, Travel Management, Travel Services, Travelers and tagged 2018 “Best in Travel” awards, Best Regional Middle East/Africa Airline, His Excellency Mr. Akbar Al Baker, Money magazine, Qatar Airways. Bookmark the permalink.